May 13 - 16: BE THERE! 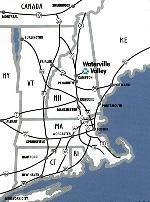 From Boston: Take I-93 N to Exit 28, then 11 miles via Rt. 49 to resort village. The Boston Triathlon Team Training Weekend is set for May 13 � 16 at Waterville Valley Ski Resort in Central New Hampshire. Directions at left. Good fun and great company! Boston Body Worker is providing on-site massage at a special BTT rate of $30 per 1/2 hour. Massages will be conducted Saturday afternoon � early evening as well as Friday night (demand permitting). Contact Josh Eckel to reserve your slot now. Arrive at your leisure. Check in at the Town Square Condo Office where condo assignment and keys will be available. We have most of the condos in Buildings A and B. 8:00am Rise and shine early for the swim workout at the Waterville Valley Athletic Club. Breakfast in condos afterward. Fuel up for the long ride. Bike along the scenic and deserted NH roads, many distances to suit all ability levels including the infamous Kancamagus climb. Lunch en route on long ride or sandwiches in condos. Afternoon trail run. Organized for the slow, medium, and fast runners. 4:00pm Yoga class, then relax in Jacuzzi at Waterville Valley Athletic Club. Dinner in the condos - For those arriving late after work, we�ll keep the food hot for you! 7:00am Breakfast provided in the condos � fuel up for the day. 8:00 - 9:00am Swim workout at Waterville Valley Athletic Club. Brick Day: Create your own bike-run distances. The ultimate trail run � summit the WV mountain! Lunch available in the condos or en route if out on the bike. Enjoy a massage at the condos. Dinner Party - DJ & dancing to follow. Time Trial Duathlon. Get out your aerohelmet and get ready to go all out for a brick-like duathlon. Riders leave every 30 seconds for a race against the clock. Cool down with a short swim, ride, run or just relax on the town square.